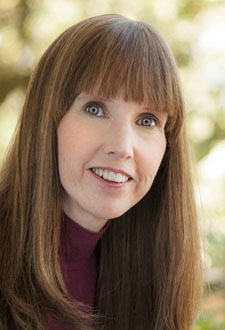 Laurie Erickson, perfumer and owner of Sonoma Scent Studio is a delightfully warm and approachable artist who can best be described as a ‘perfumista darling’ for her interesting yet affordable line (and perfumes that are available in small bottles!). Many of her perfumes reflect her love for the outdoors and nature and that love comes through in Laurie’s responses to these questions on beauty. 1) What do you mean when you call something beautiful? Do you have different definitions when you talk of different things like faces, art, landscape? Or is everything you find beautiful characterized by something similar? When I say that something is beautiful to me, I mean that it brings pleasure to my senses and/or to my heart. Beauty can be appreciated through seeing, hearing, tasting, smelling, touching, and feeling. Often, beautiful things bring me happy pleasure, but sometimes something stark or lonely can have beauty to it too. Beautiful things often have balance and harmony, but not always. Actions can also be considered beautiful when they are compassionate and touching — human kindness is beautiful. The old adage about beauty being more than skin deep may be a cliché, but it is true, of course. People are beautiful to me in ways other than their physical looks; their personalities are beautiful when they are friendly, kind, trustworthy, and thoughtful. I think what we consider to be beautiful is influenced by culture, experience (including family upbringing), genetics, and education. Some things seem to be innately beautiful to most people, but personal preference is laid over those basic human tendencies. Beauty reaches out and touches others, connecting people in our mutual admiration of beauty in the world. 2) Is there something that you find beautiful that is an exception to the above definition or which lacks the above characteristic/s? Not that I can think of at the moment because my definition of beauty is broad. 3) Do you make a distinction between aesthetically pleasing (or appealing to the senses) and beautiful? Can you call something one without it being the other? Is something that is aesthetically pleasing to you also defined by the characteristics described above? For me, even if something is not conventionally beautiful if it seems beautiful to me it will most likely also be aesthetically pleasing in some way to me, though it might not be aesthetically pleasing to others. I do have physical reactions to beautiful things: goose bumps or chills, disruption of normal breathing (forgetting to breath for a moment), and occasionally tears. There are far too many examples of beauty in each category for me to do a very good job with this question! I love impressionist paintings, partly because I was able to see an exhibit in SF many years ago. It was wonderful to see the brush strokes in person rather than to just see photos of paintings in textbooks. I loved the whole exhibit. I’ve not been fortunate enough to travel very much so I have not been able to experience many paintings and works of sculpture in person, but I thoroughly enjoyed introductory art appreciation classes in college. Michelangelo’s David was one of my favorite beautiful sculpture pieces. Maybe it is genetic because of my Dad, but I also really loved the lectures on architecture and was fascinated by the beauty found in radically different architectural styles from different cultures. I just can’t narrow this down, but the perfume of flowers in bloom is one of my favorite perfume-related smells, especially roses, sweet peas, orange blossom, and jasmine. I have fairly conventional reactions to people’s faces in terms of perceiving beauty, but a beautiful face isn’t as important to me as a beautiful spirit, so I tend to forget the names of the beautiful faces I see in the media. I mostly listen to classic rock on Pandora, but I’m open to many styles. When I think of beauty in music I tend to think of beautiful voices or classical music. For me, nature is one of the deepest, most connecting sources of beauty. From the little details of flowers and leaves to the grand drama of landscapes, the beauty of nature brings me peace. A blue sky, the golden grassy hills at dusk, the morning sun through the trees, all these things make me happy. Places I have found extremely beautiful include Moraine Lake in Canada, Yosemite, the lush redwood forests along the Pacific Northwest coast, and the California oak grasslands. 6) Is there a piece of art (or ‘thing’ or face) that you find particularly beautiful even though you are in the clear minority in that opinion? If so, could you discuss it and explain why it appeals to you? In school I found mathematics to be beautiful, for example the way partial differential equations are used to model, explain, and predict the way things work in the natural world. The arts are traditionally seen as sources of beauty, but the sciences are full of beauty too. Aging things can be physically beautiful despite conventional biases towards newness and youth. Non-living items like an old barn, vintage furniture, or old photographs can be beautiful and nostalgic even when not in pristine condition. People who are old enough to be outside conventional standards of beauty can be beautiful too; graceful aging with the wisdom and experience that accompanies it has its own beauty. Back to the nature theme, I majored in geology/geomechanics and found a fascinating beauty in some unusual geologic landscapes like Bumpass Hell, even though they don’t fit the norms of beauty. 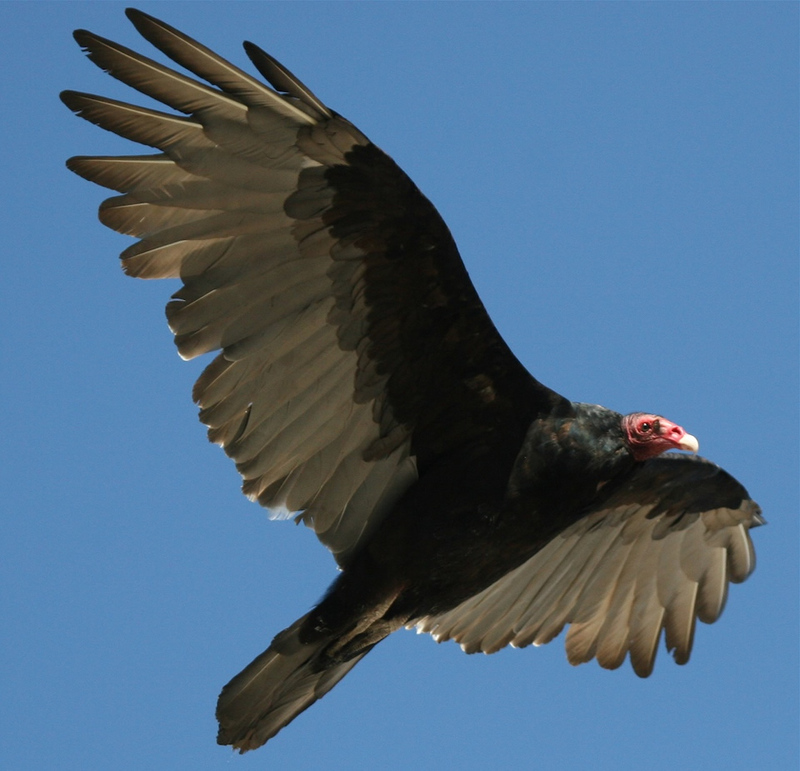 And there are plenty of animals that are not conventionally beautiful but have aspects of beauty; for example, we have turkey vultures here that would not be considered beautiful, but they are beautiful in flight. That concept of beauty in motion or deed extends to people who may not fit the common physical definition of beauty but whose actions and/or life’s work make them beautiful (back to beauty being more than skin deep). People may expect me to name some normally unpleasant smell that I love, but I don’t think I have any unusual scent preferences, except that I do love the scent of most flowers, even the dirty and potent ones like jasmine, gardenia, and narcissus. 7) Is there something that is renowned to be beautiful that either doesn’t appeal to you or that you don’t find beautiful? Could you explain why? I loved that Laurie finds beauty in science and math (in addition to the arts). What is even more interesting is she is not alone (as you will find out in the next interview/survey). And isn’t that Bumpass Hell something? 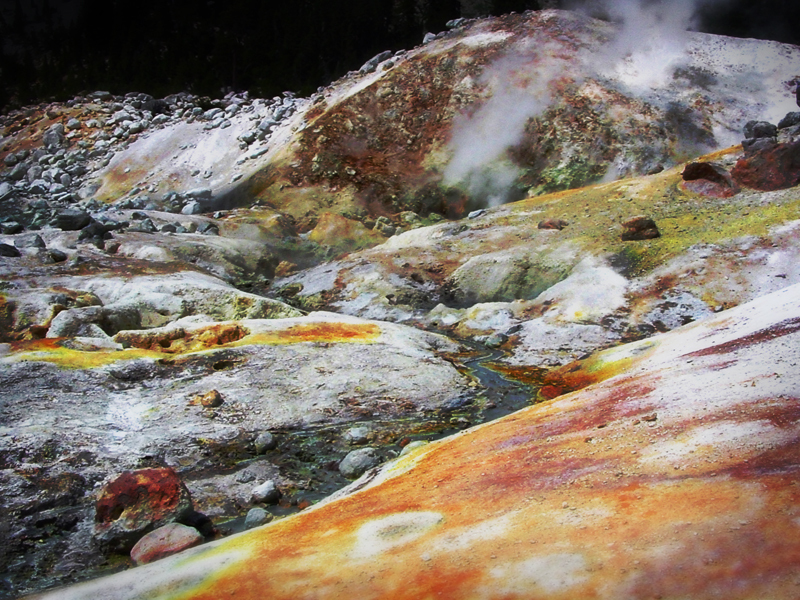 Laurie also added that ” Bumpass Hell smells awful (sulfur fumes) but is an amazing place. Volcanic deposits and roadcuts into folded rock layers can be really striking sites in an odd way too.” I agree and now ( inspite of the smell ) I really want to visit this place, don’t you? Thanks for including me in your series, Lavanya! I enjoyed pondering these questions, and it’s been really fun to read the responses from other people. I think we all have some common ground but express the ideas in different ways. I look forward to the rest of the series! Thanks for participating Laurie. And also for introducing me to Bumpass Hell. I googled to see turkey vultures in flight, I was struck how beautiful they looked! While I was choosing a picture for a beautiful landscape I went through my pictures of Lassen Park as well and thought those scenes were beautiful. I know! Bumpass Hell does look like yellowstone doesn’t it? I haven’t been to Yellowstone but it is very high on my list of places I need to see. The National Parks are one of my favorite things about the U.S.
Our family took camping trips each summer when my brother and I were growing up, and we went to both Lassen Park (the location of Bumpass Hell) and Yellowstone Park on separate trips. Yellowstone is spectacular, but I mentioned Bumpass Hell because it was such a concentration of mudpots and hot springs in a small area that the landscape feels quite eerie. Also you can’t escape the sulfur smell there, and the oppressive smell is a weird contrast to the strangely beautiful landscape. You make Bumpass Hell sound really intriguing Laurie! So much to savour in this interview – I particularly enjoyed the examples of beauty in motion (as in those otherwise not overly prepossessing vultures 😉 ) and the geological example. I am sure my brother would agree, who is in that general field. The bleak expanse of limestone pavement that is the Burren of Clare in the West of Ireland looks a bit like this, though it is much less hellish…I would also go so far as to say that the name ‘Bumpass Hell’ is beautiful, as is ‘kibble’ and ‘wedge’, though I would be hard pressed to tell you why. 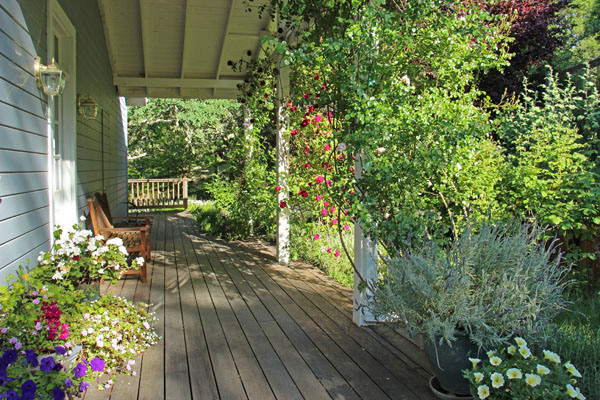 Every time I spray on a perfume by Laurie it does feel like bringing the whole glorious Sonoma countryside into your home and on your person in olfactory form. Another fabulous sets of answers to your and Suzanne’s wonderful questions. Loved it. I agree that it was great that Laurie mentioned mathematics. It’s a nice addition to the growing list of unusually beautiful things. I know!- love reading the varied examples! I loved reading this interview and I’m amazed that me and Laurie have so much in common 🙂 I’m born in Iceland (although I’ve lived in Sweden for most of my life) and there, there are areas much like Bumpass Hell, so I can well relate to the strange beauty of those kind of places (and the smell/taste of sulphur in the water…). I also love the discussion about the beauty of deeds. Nothing makes my eyes tear quicker than displays of selflessness or kindness.